And, if it is, you might say, “yeah, it really is”, and nobody would break the spell for a while. You would not think to ask the other hiker what qualified him or her to critique the beauty of this place. The lake and the mountains are the real credentials in situations like this. That is all I am really saying on this site, too. This website is aimed mostly at people who find enjoyment in things and ideas for their own sake, even when they don’t necessarily end up agreeing with them. To me, as author of most of the material on this website, “Summit Lake” is almost any place I want to return to again and again. Of course I would hope others will feel the same way. But everybody, in their own mind’e eye, already has their own “Summit Lake”. For all that it matters, this could be a rooftop in a housing development in Chicago, accessible only by a certain staircase. Such a place would be public, in the sense of a park or a wilderness, but would be private too, in the sense that no two visitors ever take away quite the same experience. Whether you are with a group of people or solo, a part of each person there is really travelling alone. This website is really written to that traveller. Underlying every designation of a “site” is the presumption that there is something about it worth sharing. This website is supposed to represent some of those parts of such journeys which you can take with you. There are probably hundreds of Summit Lake place names. 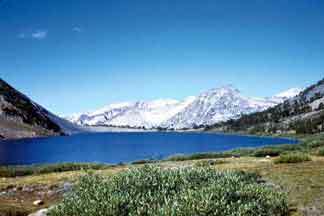 The Summit Lake that I knew is a hearty day’s ascent out of the eastern slope of the Sierras. The granite there is a characteristically striking rich reddish brown. The first half of the ascent is lushly green, steep, and beautiful, passing a progression of small lakes cradled above lower lakes like pearls on a string. The second half of the hike is steeper. It brings you to stark, mountainous terrain, to timberline, before you reach Summit Pass. The view from the pass is stunning when you finally get there, and then there is a short dip and there you are, at the head of Summit Lake. The western head of Summit Lake marks an eastern boundary of Yosemite National Park. Summit Lake is but one of many backtrail portals into Yosemite high country, John Muir’s “Range of Light”. From Summit Lake you can hike clear down Virginia Canyon, off the Matterhorn Peak topo map quadrangle, down Cold Canyon to the Tuolumne river and meadows. Or, from Virginia Canyon, you can switch north, to the upper reaches of Matterhorn Canyon. There lie the grandest peaks I have ever beheld, the imposing, snaggly, dragon-toothed Sawtooth Ridge. Once you get past the self-wonder (“I actually did this myself”), the importance of what’s really out there in the high country sinks in. If life has this grandeur, if the world is really this clean, this permanent and this exciting, shouldn’t it be that way “down there” too? You are the visitor, the voyager, but the panorama you see is indifferent — it really doesn’t care. What parts of this new perspective can you carry with you, back down to the citied places? I personally associate Summit Lake with close friends, rich experiences gained at the expense of considerable preparation and effort, and a myriad of back country trails — most of which are off the beaten path in the high Sierras. There were other places, other associations, with names like “WildPlum”, “Sawtooth Ridge”, or “Haypress Creek”. Some of these places are also written about in these pages. This website isn’t primarily about backpacking and the outdoors per se. It’s about different kinds of journeys on different levels of experience. It’s still about the processes of discovery. This website occasionally carries some strong messages about just saying “no” to intolerance, bigotry, censorship and persecution of any stripe. The subliminal message that pervades every corner of this site is: think for yourself. “Because my pastor told me so” is never an answer here. Here, as elsewhere, let’s not lose sight of the fact that there really is something else out there besides you, and me, and and our opinions. This is the nature of the world itself, our “outside frame of reference”. Ethical arguments on this website are based on a strong position on individual rights, namely, that everybody has them. We hold that rights are always an objective requirement of individual freedom in any social setting. While it is true that society has a compelling need that its citizens act from a position of liberty, the requirement itself is actually rooted in the nature of the individual. This is a far stronger argument than prevailing “social contract” and precedent law theories. About life, liberty and the pursuit of happiness: We still respect the signers of the Declaration of Independence for making a great contribution to future generations. We hardly think they had in mind “family values”, or the convenience of some majority or other, as an irreducible platform for declaring our rights to be self-evident and inalienable. We are incredibly fortunate in this country to have the American state papers as founding legal documents. If, by some cruel turn of fate, we didn’t have these papers, the premise of this website is that their principles could be re-discovered, by turning to the real world, our “outside frame of reference”. This website has zero tolerance for an ongoing debate in America about what kinds of rights people might have, and about whether or which people ought to “have” them. To us, it’s not debatable. Don’t confuse liberty with rights. To us, it’s self-evident that wherever there is human life, there are rights, and that liberty is merely the social recognition owed to that fact. Everybody has rights, but not everybody possesses liberty. We expect you to be able to validate rights yourself, without having to depend on your society, affinity group or even our own great state papers to help you along. We think our philosophy is pretty inclusive, but if you often feel uncomfortable confronting new ideas or re-examining old ones, you will not always feel entirely comfortable here. Having seen and understood all this, we’re all then generally free to continue wandering along our own paths. So, kick back and relax. Download a poem, read a story or article, or just jump off to one of the hundreds of links on this site. If you agree with stuff you find here, fine, but the point is whether or not you saw something you didn’t see before. So there you have it. I am finally content and happy in the backwaters of unread America, examining root causes, still wondering why education still isn’t easier than fighting. The pen is mightier than the sword, they say, but Smith&Wesson still gives Parker Pen and PaperMate a hell of a run for their money. After forty odd years of struggle, I do think I finally understand an essence that drives loose cannons like Hitler, Ted Kaczinski, and Pat Robertson. Sure, it’s a control issue: they want it all, their own way, and people will have to be forced to comply when they don’t “participate” voluntarily. What I think about things just isn’t necessarily the point here. If you follow the pointers, and something clicks in you didn’t see before, or, even worse, you challenge the ideas but the whole point of view clicks in, well, now, that’s almost everything. Summit Lake is a place for reflection, but it’s also a place for just listening and watching. There is stuff out there besides you and me. I like to listen to the winds whistling through the pines four miles away just on the threshold of hearing, and small waves lapping against the worn granite rocks on the far shore. I like to watch a puff of breeze riffle across the meadow grasses from one end to the other, and finally feel the coolness of that breeze blowing against my face. It’s great to get away from it all. It’s great to be alive. A cloud darkens the sky momentarily, and I muse about the day I sat out a thunderstorm in another valley. Lightning danced over the whole valley like flashbulbs in a closet, and a huge bolt struck a low peak nearby. I chose a low scrub tree for shelter, figuring there are still much higher trees nearby if lightning hits near here again. Approaching on the trail below in the flickering valley, I can still see in my mind’s eye another hiker, poncho-clad, working his way up the trail. Out of his backpack protrudes a tall aluminum fishing pole case. “Nice lightning rod!”, I finally holler, smiling, hoping he will take this chance to take shelter and tell me what he knows about the trail ahead. You can see that I was still assuming anybody crazy enough to be out here all alone must have been here before, for the discovery of this place was still all brand new to me. The lone hiker smiles and shrugs and trudges onward, disappearing soon enough into the distance ahead as the storm wanes over a distant range of mountains. I should be writing all this down, I think to myself at that time, but I never do. It’s quiet up here at this lake. I like it. This place seems to have a thousand moods and seasons, and even as that cloud passes overhead, the mood of my meadow changes by the minute. Now, as the evening breeze picks up in earnest and the orange sun begins to sink below the western range, is a good time to remember that, as my perceptions change from this meadow, it’s still the same lake. I should be thinking about a small campfire about now. I make a vow that I should like to return here again. That’s what a web page should be all about. Like the thousands of lakes that dot the mountain ranges, there are thousands of websites, and no two are ever quite the same. We hope you find that you enjoy this place, and that when you leave, you’ll bring back with you enjoyable memories that you, too, won’t ever have to write down.